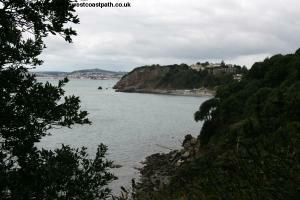 This walk starts in the bustling resort of Torquay, at the north of Torbay. 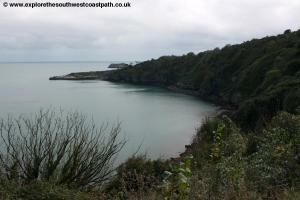 Despite going through a built-up area, this walk offers some excellent unspoilt scenery and only a little road walking. 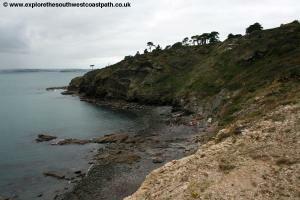 The walk climbs out of the harbour over Daddyhole Plain before descending again to the beach at Meadfoot beach. 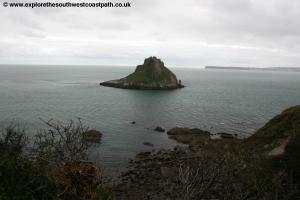 There is another climb out of Meadfoot beach up the spectacular viewpoint over Thatcher Rock, then round to Hopes Nose. 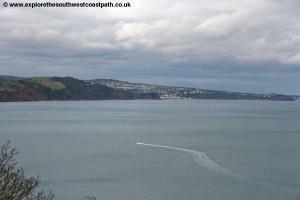 Once round Hopes Nose the path continues round Anstey's Cove and Redgate Beach over Babbacombe downs and into Babbacombe itself, where there is a cliff railway down to the beach at Oddicombe Beach. From the A38 take the A380 dual carriageway. Follow the A380 around Kingsteaignton and Newton Abbot. After Newton Abbot the road narrows to single carriageway through Kingskerswell (although a new by-pass is due to open late 2015 to alleviate this). At Kingskerswell go ahead on the A3022 and follow this through Torre to the sea front. Parking is limited in this part of Torquay. There is a small car park at Torre Abbey (turn left along the sea front) and a larger one at Shedden Hill. 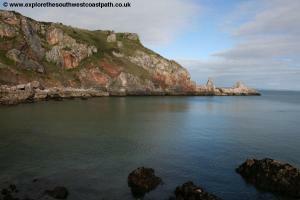 There is also the Torre Abbey car park around 5 minutes walk from the sea front along the road you came in on. Failing this, there is a large car park at the harbour and several in the town centre. 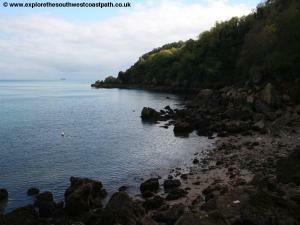 Your spoilt for choice for accommodation in Torquay and Babbacombe. There is a large range of hotels available in the area to suit all tastes and budgets. 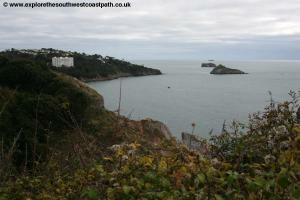 There is also a good range of self catering accommodation in the area, especially towards Paignton. 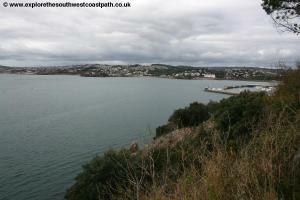 There is a tourist information centre in Torquay, on the harbour side that carries full lists of local accommodation. For more information, see the links below. From Torquay station head down the road past the Grand Hotel to the sea front. Cross the busy dual carriageway ahead and turn left along the road, with the sea on your right. The beach here is Torre Abbey sands and the only sandy beach close to the town centre. It is covered at high tide however. 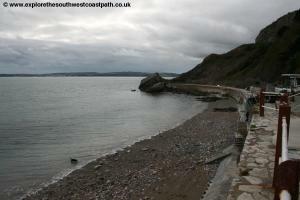 Here you have a choice of a low level promenade at the back of the beach or the pavement beside the road. The lower promenade ends at a bridge going over the road, so if you've followed this route, take the path back up to the road here. 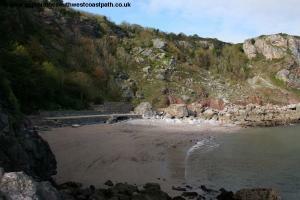 Now follow the coast path beside the road, passing a modern development of shops and restaurants on the left. Continue past the toilets along the promenade, where there are now gardens between you and the road. Soon you reach the Princess Theatre, the main theatre in Torquay. Just past the theatre go on the path along the back of the harbour, soon with the ferris wheel and pavilion on the left. On reaching the inner harbour ahead, the town centre can be reached by turning left, and the main bus stops are along the Strand at the back of the harbour. 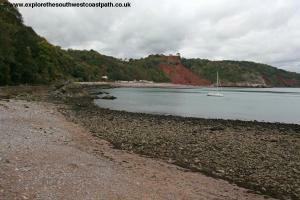 However to continue the walk, turn right and take the new bridge that links the inner and outer harbours. Continue ahead to reach the road, Beacon Hill, and turn right along it. 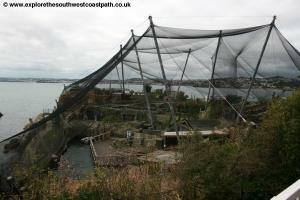 To the right you soon have the Living Coasts zoo. Continue on the road past Imperial Court on the right. After passing the drive to Imperial Court, take the next path, what looks like a private drive leading to the large Imperial Hotel. Follow the hotels' drive past the car park on the left and the hotel entrance. Once past the car park take the path to the left, which is the coast path. This soon heads up to a garden and is a path between walls. As you near the end, there is an arch on the left, take this, as the short path ahead is a dead-end.. 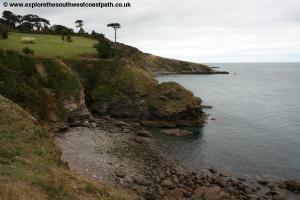 The path then runs along the cliff tops, surrounded by trees and bushes, with the gardens of houses to your left. This continues for around Â¼ of a mile until you emerge into the open ground of Daddyhole Plain. Take the obvious coast path through here passing the car park on the left and onwards on the path right along the cliff top again with houses to the left. The path emerges onto the minor road of Daddyhole Road. Go ahead along this road, but as it turns to the left, look out for the footpath through a stone arch to the right, which you take heading down hill with steps in places to reach the beach at Meadfoot beach. This is a blue flag beach and quite secluded, facing south east. There is a cafe to the right here and an impressive crescent up to the left. Continue along the promenade beside the road at the back of the beach. On reaching the car park at the end, look for the coast path heading up hill through the bushes at the end of the car park, which you take. This brings you to the road, Ilsham Marine Drive, where you turn right. You pass a rather ugly block of flats, Kilmorie, on the left. Follow the road until you have a large park on the right. 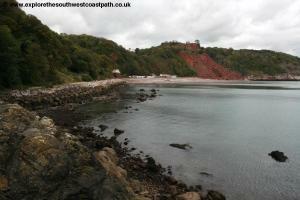 Here the coast path turns off on a hedge lined path just before the park. This is a beautiful location, with Thatcher's Rock just off the coast. The park adjacent to the path is open to the public and has numerous seats to enjoy the fine views. Beyond the park the path continues between hedges on the cliff top, with a large house to the left, Thatcher House. There is a rocky beach just below the cliffs here. The path continues between hedges heading back north beside a rocky beach to the right to rejoin the road. Here turn right and follow the road. 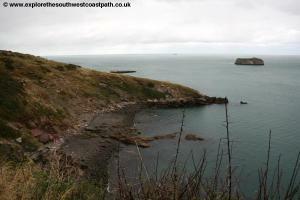 A short distance further off there is a footpath to the right along the headland of Hope's Nose. Whilst not an official part of the coast path, it is highly recommended and there is a good circular walk signed around the headland. You have good views of the small rocky islands of Thatcher's Rock, Ore Stone and Lead Stone from here. At the very end, is a former quarry now returned to nature. This path returns you to the road. Whether you took the path around Hope's Nose or not, the path now continues ahead, back on the road but only for a few metres. Look for steps up from the road on the left of the road, and follow this, as the path now runs parallel and just above the road, avoiding the need to walk on the road. The path continues along the back of the houses and turns left with the road. Soon it brings you out to the road once more. Cross the road and take the tarmac path ahead, signed as a footpath. This goes just to the left of the houses ahead and soon heads into woodland, a lovely cliff top walk around Black Head. 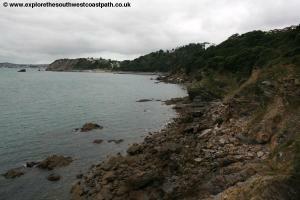 After around half a mile the path emerges onto the minor road at the back of Anstey's Cove. Turn right on the road and very soon after there is a path down to the beach at the right. This is a dead-end path and the beach at Anstey's Cove is a rock and shingle beach with toilets and a small cafÃ© at the back. There is also a promenade, which used to lead over a wooden bridge to the next beach, Redgate Beach. Sadly this was closed in 1998 due to cliffs falls which the council claimed made the beach unsafe. It has always been a controversial decision since this is one of the best sandy beaches in Torquay and is both secluded and beautiful. Whilst there have been cliffs falls here there have also been major falls at Oddicombe, which remains open. Despite it's closure, it is still commonly accessed. If you head down to the beach, take the same path back up to the road. 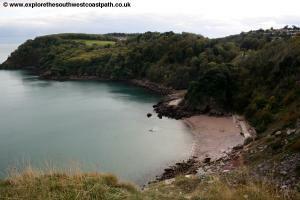 Returning to the coast path and the road past Anstey's Cove, continue on the road past the car park on the left then look out for the coast path signed off on a path with steps to the right, once the road is back in the woodland. 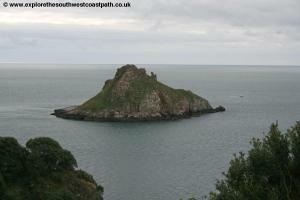 This soon emerges onto Babbacombe Downs, which offer wonderful views back over Anstey's Cove and Redgate Beach. Take the coastal route over the downs, with an old quarry below and behind the fences to the right. Continue past a rather vandalised shelter and then the path heads steeply down to Babbacombe beach on the right, emerging on the road near the end. There is a pub and good beach here and a low-level path around to Oddicombe beach. The walk ends here. To get back to Torquay, Stagecoach South West bus services 32 and 22 run every 10 minutes from Babbacombe Road at the end of Walls Hill Road to Torquay Monday – Saturday and every 30 minutes on Sundays. Ordnance Survey Explorer 110 (Torquay & Dawlish) covers the coast between Torquay and Babbacombe and is available in the tourist information centre in Torquay, from bookshops locally and from online retailers. The following links also show the maps of this area.